This is a great article about a plant that should be used more frequently in planted ponds and tub gardens! Sometimes you just need to loaf… I was wandering around my computer, doing random searches. I went to my default setting and looked for aquarium related plants. I wasn’t really looking for find anything, but more to see what was available. I surfed through the listings, and came across one with a bunch of plants I hadn’t seen before. I pulled out my trusty Aquarium Plants by Christel Kasselmann, and was able to Identify all the plants listed but one. So I turned to the internet, and I found it! Hygroryza aristata was first described way back in 1789 as Pharus aristatus. The plant is actually native to Southeast Asia, specifically India, Sri Lanka, Pakistan and China. But what surprised me about this plant is that it is actually a species of grass. In fact, it is the only species of grass that can be kept in either a pond or aquarium. Of the over 10,000 species of grass (including both domesticated and wild species) only one, Hygroryza aristata is suitable for aquatic usage. It is a monospecific (a genus with only one species) floating species, with a central stem from with leaves branch approximately every 1.5 cm (.5”) to every 10cm (4”) depending on growth conditions. Each branch, which alternates from one side of the main stem to the other, consists of an inflated leaf sheath and then the leaf itself. The leaf sheath (described by one source on the internet as “water wings for the rest of the plant”) is a tubular section approximately 10 cm (4”) in length and 1.5 cm (.5”) in circumference. As inferred, this leaf sheath enables the plant to float. The leaf is about the same length as the leaf sheath but about double the width at the maximum spread, is elliptical in shape, and can range in colour from a light through dark green shade and in optimum growth conditions will show a purplish tint. It will either float on the water or will grow emergent above the water. The roots, similar to those of water lettuce (Pistia stratiotes), are long and feathery, resulting in an excellent hiding place for fry and shy fish. The roots descend from each branching of a leaf portion from the main stem. In nature, the plant can form dense floating mats in both lakes and slow moving streams. As mentioned, it is native to Southeast Asia and has been used as a forage source for cattle, but it has also become a weed species in rice paddies. There is some concern that it may become an invasive species in the southern United States. Aquatic hobbyist usage can be both for open top aquariums and ponds. It apparently required high to very high lighting, and is reputed to be a nutrient hog. If sufficient nutrients are not present, there may be yellowing of the leaves. As such, it is recommended that good fertilization of the aquatic environment occur. But if care requirements are met, it will grow very fast and require pruning to prevent if overshadowing other plants beneath. Propagation is by stem fragments (that means that you can probably break the stem, and each piece will result in a new plant) or occasionally by seed. 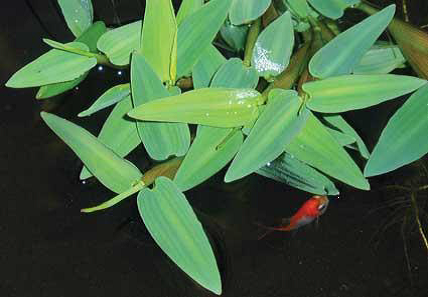 This is a plant worth seeking out in larger pond supply locations, because it is so suitable for use in goldfish ponds and outside tub gardens.